Hyperbaric medicine includes hyperbaric oxygen treatment, which is the medical use of oxygen at greater than atmospheric pressure to increase the availability of oxygen in the body; and therapeutic recompression, which involves increasing the ambient pressure on a person, usually a diver, to treat decompression sickness or an air embolism by eliminating bubbles that have formed within the body. Enhancement of healing in selected problem wounds;. Evidence is insufficient to support its use in autism, cancer, diabetes, HIV/AIDS, Alzheimer's disease, asthma, Bell's palsy, cerebral palsy, depression, heart disease, migraines, multiple sclerosis, Parkinson's disease, spinal cord injury, sports injuries, or stroke. A Cochrane review published in 2016 has raised questions about the ethical basis for future clinical trials of hyperbaric oxygen therapy, in view of the increased risk of damage to the eardrum in children with autism spectrum disorders. Despite the lack of evidence, in 2015, the number of people utilizing this therapy has continued to rise. There is limited evidence that hyperbaric oxygen therapy improves hearing in patients with sudden sensorineural hearing loss who present within two weeks of hearing loss. There is some indication that HBOT might improve tinnitus presenting in the same time frame. HBOT in diabetic foot ulcers increased the rate of early ulcer healing but does not appear to provide any benefit in wound healing at long-term follow-up. In particular, there was no difference in major amputation rate. For venous, arterial and pressure ulcers, no evidence was apparent that HBOT provides a long-term improvement over standard treatment. As of 2012, there is insufficient evidence to support using hyperbaric oxygen therapy to treat people who have traumatic brain injuries. In stroke, HBOT does not show benefit. HBOT in multiple sclerosis has not shown benefit and routine use is not recommended. In alternative medicine, hyperbaric medicine has been promoted as a treatment for cancer. A 2012 review article in the journal, Targeted Oncology, reports that "there is no evidence indicating that HBO neither acts as a stimulator of tumor growth nor as an enhancer of recurrence. On the other hand, there is evidence that implies that HBO might have tumor-inhibitory effects in certain cancer subtypes, and we thus strongly believe that we need to expand our knowledge on the effect and the mechanisms behind tumor oxygenation." However, a 2011 study by the American Cancer Society reported no evidence it is effective for this purpose. Low-quality evidence suggests that hyperbaric oxygen therapy may reduce the pain associated with an acute migraine headache in some cases. It is not known which people would benefit from this treatment, and there is no evidence that hyperbaric medicine can prevent future migraines. More research is necessary to confirm the effectiveness of hyperbaric oxygen therapy for treating migraines. COPD with air trapping – can lead to pneumothorax during treatment. High fevers – In most cases the fever should be lowered before HBO treatment begins. Fevers may predispose to convulsions. The therapeutic consequences of HBOT and recompression result from multiple effects. The increased overall pressure is of therapeutic value in the treatment of decompression sickness and air embolism as it provides a physical means of reducing the volume of inert gas bubbles within the body; Exposure to this increased pressure is maintained for a period long enough to ensure that most of the bubble gas is dissolved back into the tissues, removed by perfusion and eliminated in the lungs. The improved concentration gradient for inert gas elimination (oxygen window) by using a high partial pressure of oxygen increases the rate of inert gas elimination in the treatment of decompression sickness. For many other conditions, the therapeutic principle of HBOT lies in its ability to drastically increase partial pressure of oxygen in the tissues of the body. The oxygen partial pressures achievable using HBOT are much higher than those achievable while breathing pure oxygen under normobaric conditions (i.e. at normal atmospheric pressure). This effect is achieved by an increase in the oxygen transport capacity of the blood. At normal atmospheric pressure, oxygen transport is limited by the oxygen binding capacity of hemoglobin in red blood cells and very little oxygen is transported by blood plasma. Because the hemoglobin of the red blood cells is almost saturated with oxygen at atmospheric pressure, this route of transport cannot be exploited any further. Oxygen transport by plasma, however, is significantly increased using HBOT because of the higher solubility of oxygen as pressure increases. A study suggests that exposure to hyperbaric oxygen (HBOT) might also mobilize stem/progenitor cells from the bone marrow by a nitric oxide-dependent mechanism. The traditional type of hyperbaric chamber used for therapeutic recompression and HBOT is a rigid shelled pressure vessel. Such chambers can be run at absolute pressures typically about 6 bars (87 psi), 600,000 Pa or more in special cases. Navies, professional diving organizations, hospitals, and dedicated recompression facilities typically operate these. They range in size from semi-portable, one-patient units to room-sized units that can treat eight or more patients. The larger units may be rated for lower pressures if they are not primarily intended for treatment of diving injuries. the entry lock that allows human entry—a separate chamber with two hatches, one to the outside and one to the main chamber, which can be independently pressurized to allow patients to enter or exit the main chamber while it is still pressurized. a built-in breathing system (BIBS) to supply and exhaust treatment gas. Flexible monoplace chambers are available ranging from collapsible flexible aramid fiber-reinforced chambers which can be disassembled for transport via truck or SUV, with a maximum working pressure of 2 bar above ambient complete with BIBS allowing full oxygen treatment schedules. to portable, air inflated "soft" chambers that can operate at between 0.3 and 0.5 bars (4.4 and 7.3 psi) above atmospheric pressure with no supplemental oxygen, and longitudinal zipper closure. In the larger multiplace chambers, patients inside the chamber breathe from either "oxygen hoods" – flexible, transparent soft plastic hoods with a seal around the neck similar to a space suit helmet – or tightly fitting oxygen masks, which supply pure oxygen and may be designed to directly exhaust the exhaled gas from the chamber. During treatment patients breathe 100% oxygen most of the time to maximise the effectiveness of their treatment, but have periodic "air breaks" during which they breathe chamber air (21% oxygen) to reduce the risk of oxygen toxicity. The exhaled treatment gas must be removed from the chamber to prevent the buildup of oxygen, which could present a fire risk. Attendants may also breathe oxygen some of the time to reduce their risk of decompression sickness when they leave the chamber. The pressure inside the chamber is increased by opening valves allowing high-pressure air to enter from storage cylinders, which are filled by an air compressor. Chamber air oxygen content is kept between 19% and 23% to control fire risk (US Navy maximum 25%). If the chamber does not have a scrubber system to remove carbon dioxide from the chamber gas, the chamber must be isobarically ventilated to keep the CO2 within acceptable limits. A soft chamber may be pressurised directly from a compressor. or from storage cylinders. Smaller "monoplace" chambers can only accommodate the patient, and no medical staff can enter. The chamber may be pressurised with pure oxygen or compressed air. If pure oxygen is used, no oxygen breathing mask or helmet is needed, but the cost of using pure oxygen is much higher than that of using compressed air. If compressed air is used, then an oxygen mask or hood is needed as in a multiplace chamber. Most monoplace chambers can be fitted with a demand breathing system for air breaks. In low pressure soft chambers, treatment schedules may not require air breaks, because the risk of oxygen toxicity is low due to the lower oxygen partial pressures used (usually 1.3 ATA), and short duration of treatment. For alert, cooperative patients, air breaks provided by mask are more effective than changing the chamber gas because they provide a quicker gas change and a more reliable gas composition both during the break and treatment periods. Initially, HBOT was developed as a treatment for diving disorders involving bubbles of gas in the tissues, such as decompression sickness and gas embolism, It is still considered the definitive treatment for these conditions. The chamber treats decompression sickness and gas embolism by increasing pressure, reducing the size of the gas bubbles and improving the transport of blood to downstream tissues. After elimination of bubbles, the pressure is gradually reduced back to atmospheric levels. Hyperbaric chambers are also used for animals, especially race horses where a recovery is worth a great deal to their owners. It is also used to treat dogs and cats in pre- and post-surgery treatment to strengthen their systems prior to surgery and then accelerate healing post surgery. There are several sizes of portable chambers, which are used for home treatment. These are usually referred to as "mild personal hyperbaric chambers", which is a reference to the lower pressure (compared to hard chambers) of soft-sided chambers. 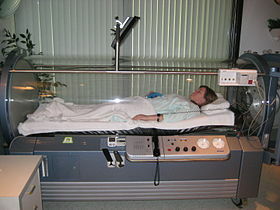 In the US, these "mild personal hyperbaric chambers" are categorized by the FDA as CLASS II medical devices and requires a prescription in order to purchase one or take treatments. The most common option (but not approved by FDA) some patients choose is to acquire an oxygen concentrator which typically delivers 85–96% oxygen as the breathing gas. Oxygen is never fed directly into soft chambers but is rather introduced via a line and mask directly to the patient. FDA approved oxygen concentrators for human consumption in confined areas used for HBOT are regularly monitored for purity (+/- 1%) and flow (10 to 15 liters per minute outflow pressure). An audible alarm will sound if the purity ever drops below 80%. Personal hyperbaric chambers use 120 volt or 220 volt outlets. There are reports that cataract may progress following HBOT. Patients inside the chamber may notice discomfort inside their ears as a pressure difference develops between their middle ear and the chamber atmosphere. This can be relieved by ear clearing using the Valsalva maneuver or other techniques. Continued increase of pressure without equalising may cause ear drums to rupture, resulting in severe pain. As the pressure in the chamber increases further, the air may become warm. HBOT is recognized by Medicare in the United States as a reimbursable treatment for 14 UHMS "approved" conditions. A 1-hour HBOT session may cost between $300 and higher in private clinics, and over $2,000 in hospitals. U.S. physicians (either M.D., D.O., D.D.S., D.M.D., D.C., N.D.) may lawfully prescribe HBOT for "off-label" conditions such as stroke, and migraine. Such patients are treated in outpatient clinics. In the United Kingdom most chambers are financed by the National Health Service, although some, such as those run by Multiple Sclerosis Therapy Centres, are non-profit. In Australia, HBOT is not covered by Medicare as a treatment for multiple sclerosis. China and Russia treat more than 80 maladies, conditions and trauma with HBOT. The University of Birmingham's 2012 guidance to West Midlands primary care trusts and clinical commissioning groups concluded "The primary research studies investigating the efficacy of HBOT are remarkable for the consistent poor quality of the published clinical trials as well as the lack of evidence demonstrating significant health benefits. There is a lack of adequate clinical evidence to support the view that HBOT therapy is efficacious for any of the indications for which it is being used". Aspects under research include radiation-induced hemorrhagic cystitis; and inflammatory bowel disease. Tentative evidence shows a possible benefit in cerebrovascular diseases. The clinical experience and results so far published has promoted the use of HBOT therapy in patients with cerebrovascular injury and focal cerebrovascular injuries. However, the power of clinical research is limited because of the shortage of randomized controlled trials. A 2010 review of studies of HBOT applied to wounds from radiation therapy reported that, while most studies suggest a beneficial effect, more experimental and clinical research is needed to validate its clinical use. Orval J Cunningham, a professor of anaesthesia at the University of Kansas in the early 1900s observed that people suffering from circulatory disorders did better at sea level than at altitude and this formed the basis for his use of hyperbaric air. In 1918 he successfully treated patients suffering from the Spanish flu with hyperbaric air. In 1930 the American Medical Association forced him to stop hyperbaric treatment, since he did not provide acceptable evidence that the treatments were effective. The English scientist Joseph Priestley discovered oxygen in 1775. Shortly after its discovery, there were reports of toxic effects of hyperbaric oxygen on the central nervous system and lungs, which delayed therapeutic applications until 1937, when Behnke and Shaw first used it in the treatment of decompression sickness. In 1955 and 1956 Churchill-Davidson, in the UK, used hyperbaric oxygen to enhance the radiosensitivity of tumours, while Ite Boerema [nl], at the University of Amsterdam, successfully used it in cardiac surgery. In 1961 Willem Hendrik Brummelkamp [nl] et al. published on the use of hyperbaric oxygen in the treatment of clostridial gas gangrene. Undersea and Hyperbaric Medical Society – US based organisation for research and education in hyperbaric physiology and medicine. ^ a b Gesell, Laurie B. (2008). Hyperbaric Oxygen Therapy Indications. The Hyperbaric Oxygen Therapy Committee Report (12th ed.). Durham, NC: Undersea and Hyperbaric Medical Society. ISBN 978-0-930406-23-3. ^ "Indications for hyperbaric oxygen therapy". Undersea & Hyperbaric Medical Society. 2011. Retrieved 21 August 2011. ^ Undersea and Hyperbaric Medical Society. "Air or Gas Embolism". Retrieved 2011-08-21. ^ Undersea and Hyperbaric Medical Society. "Carbon Monoxide". Retrieved 2011-08-21. ^ Piantadosi CA (2004). "Carbon monoxide poisoning". Undersea & Hyperbaric Medicine. 31 (1): 167–77. PMID 15233173. ^ Undersea and Hyperbaric Medical Society. "Cyanide Poisoning". Retrieved 2011-08-21. ^ Hall AH, Rumack BH (Sep 1986). "Clinical toxicology of cyanide". Annals of Emergency Medicine. 15 (9): 1067–1074. doi:10.1016/S0196-0644(86)80131-7. PMID 3526995. ^ Takano T, Miyazaki Y, Nashimoto I, Kobayashi K (Sep 1980). "Effect of hyperbaric oxygen on cyanide intoxication: in situ changes in intracellular oxidation reduction". Undersea Biomedical Research. 7 (3): 191–7. PMID 7423657. ^ Undersea and Hyperbaric Medical Society. "Central Retinal Artery Occlusion". Retrieved 2014-05-30. ^ Undersea and Hyperbaric Medical Society. "Clostridal Myositis and Myonecrosis (Gas gangrene)". Retrieved 2011-08-21. ^ Hart GB, Strauss MB (1990). "Gas Gangrene - Clostridial Myonecrosis: A Review". J. Hyperbaric Med. 5 (2): 125–144. ^ Zamboni WA, Riseman JA, Kucan JO (1990). "Management of Fournier's Gangrene and the role of Hyperbaric Oxygen". J. Hyperbaric Med. 5 (3): 177–186. ^ Undersea and Hyperbaric Medical Society. "Crush Injury, Compartment syndrome, and other Acute Traumatic Ischemias". Retrieved 2011-08-21. ^ Bouachour G, Cronier P, Gouello JP, Toulemonde JL, Talha A, Alquier P (Aug 1996). "Hyperbaric oxygen therapy in the management of crush injuries: a randomized double-blind placebo-controlled clinical trial". The Journal of Trauma. 41 (2): 333–9. doi:10.1097/00005373-199608000-00023. PMID 8760546. ^ Undersea and Hyperbaric Medical Society. "Decompression Sickness or Illness and Arterial Gas Embolism". Retrieved 2011-08-21. ^ Brubakk, A. O.; T. S. Neuman (2003). Bennett and Elliott's physiology and medicine of diving (5th Rev ed.). United States: Saunders Ltd. p. 800. ISBN 978-0-7020-2571-6. ^ Acott, C. (1999). "A brief history of diving and decompression illness". South Pacific Underwater Medicine Society Journal. 29 (2). ISSN 0813-1988. OCLC 16986801. Retrieved 2008-03-18. ^ Undersea and Hyperbaric Medical Society. "Enhancement of Healing in Selected Problem Wounds". Retrieved 2011-08-21. ^ Zamboni WA, Wong HP, Stephenson LL, Pfeifer MA (Sep 1997). "Evaluation of hyperbaric oxygen for diabetic wounds: a prospective study". Undersea & Hyperbaric Medicine. 24 (3): 175–9. PMID 9308140. ^ a b Kranke, Peter; Bennett, Michael H.; Martyn-St James, Marrissa; Schnabel, Alexander; Debus, Sebastian E.; Weibel, Stephanie (2015-06-24). "Hyperbaric oxygen therapy for chronic wounds" (PDF). The Cochrane Database of Systematic Reviews (6): CD004123. doi:10.1002/14651858.CD004123.pub4. ISSN 1469-493X. PMID 26106870. ^ Abidia A, Laden G, Kuhan G, Johnson BF, Wilkinson AR, Renwick PM, Masson EA, McCollum PT (Jun 2003). "The role of hyperbaric oxygen therapy in ischaemic diabetic lower extremity ulcers: a double-blind randomised-controlled trial". European Journal of Vascular and Endovascular Surgery. 25 (6): 513–518. doi:10.1053/ejvs.2002.1911. PMID 12787692. ^ Kalani M, Jörneskog G, Naderi N, Lind F, Brismar K (2002). "Hyperbaric oxygen (HBO) therapy in treatment of diabetic foot ulcers. Long-term follow-up". Journal of Diabetes and its Complications. 16 (2): 153–158. doi:10.1016/S1056-8727(01)00182-9. PMID 12039398. ^ Chen, J (2003). "The Effects of Hyperbaric Oxygen Therapy on Diabetic Retinopathy". Investigative Ophthalmology & Visual Science. 44 (5): 4017–B720. ^ Chang YH, Chen PL, Tai MC, Chen CH, Lu DW, Chen JT (Aug 2006). "Hyperbaric oxygen therapy ameliorates the blood-retinal barrier breakdown in diabetic retinopathy". Clinical & Experimental Ophthalmology. 34 (6): 584–589. doi:10.1111/j.1442-9071.2006.01280.x. PMID 16925707. ^ Basile C, Montanaro A, Masi M, Pati G, De Maio P, Gismondi A (2002). "Hyperbaric oxygen therapy for calcific uremic arteriolopathy: a case series". Journal of Nephrology. 15 (6): 676–80. PMID 12495283. ^ Undersea and Hyperbaric Medical Society. "Severe Anemia". ^ Hart GB, Lennon PA, Strauss MB (1987). "Hyperbaric oxygen in exceptional acute blood-loss anemia". J. Hyperbaric Med. 2 (4): 205–210. Retrieved 2008-05-19. ^ Undersea and Hyperbaric Medical Society. "Idiopathic Sudden Sensorineural Hearing Loss". Retrieved 2014-05-30. ^ Undersea and Hyperbaric Medical Society. "Intracranial Abscess". Retrieved 2011-08-21. ^ Lampl LA, Frey G, Dietze T, Trauschel M (1989). "Hyperbaric Oxygen in Intracranial Abscesses". J. Hyperbaric Med. 4 (3): 111–126. Retrieved 2008-05-19. ^ Chamilos, G; Kontoyiannis, DP (2015). "Chapter 133: Aspergillus, Candida, and other opportunistic mold infections of the lung". In Grippi, MA; Elias, JA; Fishman, JA; Kotloff, RM; Pack, AI; Senior, RM. Fishman's Pulmonary Diseases and Disorders (5th ed.). McGraw-Hill. p. 2065. ISBN 978-0-07-179672-9. ^ Undersea and Hyperbaric Medical Society. "Necrotizing Soft Tissue Infections". Retrieved 2011-08-21. ^ Escobar SJ, Slade JB, Hunt TK, Cianci P (2005). "Adjuvant hyperbaric oxygen therapy (HBO2)for treatment of necrotizing fasciitis reduces mortality and amputation rate". Undersea & Hyperbaric Medicine. 32 (6): 437–43. PMID 16509286. ^ Undersea and Hyperbaric Medical Society. "Refractory Osteomyelitis". Retrieved 2011-08-21. ^ Mader JT, Adams KR, Sutton TE (1987). "Infectious diseases: pathophysiology and mechanisms of hyperbaric oxygen". J. Hyperbaric Med. 2 (3): 133–140. Retrieved 2008-05-16. ^ Kawashima M, Tamura H, Nagayoshi I, Takao K, Yoshida K, Yamaguchi T (2004). "Hyperbaric oxygen therapy in orthopedic conditions". Undersea & Hyperbaric Medicine. 31 (1): 155–62. PMID 15233171. ^ Undersea and Hyperbaric Medical Society. "Hyperbaric Oxygen Treatments for Complications of radiation Therapy". Retrieved 2011-08-21. ^ Zhang LD, Kang JF, Xue HL (Jul 1990). "Distribution of lesions in the head and neck of the humerus and the femur in dysbaric osteonecrosis". Undersea Biomedical Research. 17 (4): 353–8. OCLC 2068005. PMID 2396333. ^ Lafforgue P (Oct 2006). "Pathophysiology and natural history of avascular necrosis of bone". Joint, Bone, Spine : Revue du Rhumatisme. 73 (5): 500–7. doi:10.1016/j.jbspin.2006.01.025. PMID 16931094. ^ Undersea and Hyperbaric Medical Society. "Skin Grafts and Flaps Compromised". Retrieved 2011-08-21. ^ Undersea and Hyperbaric Medical Society. "Thermal Burns". Retrieved 2011-08-21. ^ Cianci P, Lueders H, Lee H, Shapiro R, Sexton J, Williams C, Green B (1988). "Adjunctive Hyperbaric Oxygen Reduces the Need for Surgery in 40–80% Burns". J. Hyperbaric Med. 3 (2): 97–101. Retrieved 2008-05-16. ^ "Hyperbaric Oxygen Therapy: Don't Be Misled". Food and Drug Administration. 22 August 2013. ^ a b Bennett M, Heard R (2004). Bennett MH, ed. "Hyperbaric oxygen therapy for multiple sclerosis". The Cochrane Database of Systematic Reviews (1): CD003057. doi:10.1002/14651858.CD003057.pub2. PMID 14974004. ^ a b Bennett, MH; Weibel, S; Wasiak, J; Schnabel, A; French, C; Kranke, P (12 November 2014). "Hyperbaric oxygen therapy for acute ischaemic stroke". The Cochrane Database of Systematic Reviews. 11 (11): CD004954. doi:10.1002/14651858.CD004954.pub3. PMID 25387992. ^ Xiong, T; Chen, H; Luo, R; Mu, D (13 October 2016). "Hyperbaric oxygen therapy for people with autism spectrum disorder (ASD)". The Cochrane Database of Systematic Reviews. 10: CD010922. doi:10.1002/14651858.CD010922.pub2. PMID 27737490. ^ Walker, Joseph. "Hyperbaric Oxygen Therapy Gets More Popular as Unapproved Treatment". Wall Street Journal. Retrieved 2015-03-14. ^ Bennett, M. H.; Kertesz, T.; Perleth, M.; Yeung, P.; Lehm, J. P. (17 October 2012). "Hyperbaric oxygen for idiopathic sudden sensorineural hearing loss and tinnitus (Review)". Cochrane Database of Systematic Reviews. 10: CD004739. doi:10.1002/14651858.CD004739.pub4. PMID 23076907. ^ Lauvrak, Vigdis; Frønsdal, Katrine Bjørnebek; Ormstad, Sari Susanna; Vaagbø, G; Fure, Brynjar (10 March 2015). Effectiveness of Hyperbaric Oxygen Therapy in patients with Late Radiation Tissue Injury or Diabetic Foot Ulcer. ISBN 978-82-8121-945-8. ^ Bennett, Michael H.; Feldmeier, John; Hampson, Neil B.; Smee, Robert; Milross, Christopher (2016-04-28). "Hyperbaric oxygen therapy for late radiation tissue injury". The Cochrane Database of Systematic Reviews. 4: CD005005. doi:10.1002/14651858.CD005005.pub4. ISSN 1469-493X. PMID 27123955. ^ Bennett, MH; Trytko, B; Jonker, B (12 December 2012). "Hyperbaric oxygen therapy for the adjunctive treatment of traumatic brain injury". The Cochrane Database of Systematic Reviews. 12: CD004609. doi:10.1002/14651858.CD004609.pub3. PMID 23235612. ^ Carson S, McDonagh M, Russman B, Helfand M (Dec 2005). "Hyperbaric oxygen therapy for stroke: a systematic review of the evidence". Clinical Rehabilitation. 19 (8): 819–33. doi:10.1191/0269215505cr907oa. PMID 16323381. ^ Bennett M, Heard R (Apr 2010). "Hyperbaric oxygen therapy for multiple sclerosis". CNS Neuroscience & Therapeutics. 16 (2): 115–24. doi:10.1111/j.1755-5949.2009.00129.x. PMID 20415839. ^ a b c McDonagh MS, Morgan D, Carson S, Russman BS (Dec 2007). "Systematic review of hyperbaric oxygen therapy for cerebral palsy: the state of the evidence". Developmental Medicine and Child Neurology. 49 (12): 942–7. doi:10.1111/j.1469-8749.2007.00942.x. PMID 18039243. ^ a b Collet JP, Vanasse M, Marois P, Amar M, Goldberg J, Lambert J, Lassonde M, Hardy P, Fortin J, Tremblay SD, Montgomery D, Lacroix J, Robinson A, Majnemer A (Feb 2001). "Hyperbaric oxygen for children with cerebral palsy: a randomised multicentre trial. HBO-CP Research Group". Lancet. 357 (9256): 582–6. doi:10.1016/S0140-6736(00)04054-X. PMID 11558483. ^ Moen, Ingrid; Stuhr, Linda E. B. (26 May 2017). "Hyperbaric oxygen therapy and cancer—a review". Targeted Oncology. 7 (4): 233–242. doi:10.1007/s11523-012-0233-x. ISSN 1776-2596. PMC 3510426. PMID 23054400. ^ "Hyperbaric Oxygen Therapy". American Cancer Society. 14 April 2011. Retrieved 14 February 2015. ^ a b c Bennett, Michael H.; French, Christopher; Schnabel, Alexander; Wasiak, Jason; Kranke, Peter; Weibel, Stephanie (2015-12-28). "Normobaric and hyperbaric oxygen therapy for the treatment and prevention of migraine and cluster headache". The Cochrane Database of Systematic Reviews (12): CD005219. doi:10.1002/14651858.CD005219.pub3. ISSN 1469-493X. PMID 26709672. ^ Ustundag A, Duydu Y, Aydin A, Eken A, Dundar K, Uzun G (Oct 2008). "Evaluation of the potential genotoxic effects of hyperbaric oxygen therapy". Toxicology Letters. 180: S142. doi:10.1016/j.toxlet.2008.06.792. ^ Mortensen, Christian Risby (2008). "Hyperbaric oxygen therapy". Current Anaesthesia & Critical Care. 19 (5–6): 333–337. doi:10.1016/j.cacc.2008.07.007. PMC 1273677. ^ a b c d e Jain, KK. "Indications, Contraindications, and Complications of HBO Therapy" (PDF). Textbook of Hyperbaric Medicine. pp. 75–80. Retrieved 22 September 2016. ^ a b Broome JR, Smith DJ (Nov 1992). "Pneumothorax as a complication of recompression therapy for cerebral arterial gas embolism". Undersea Biomedical Research. 19 (6): 447–55. PMID 1304671. ^ a b c Marx, JA, ed. (2002). "chapter 194". Rosen's Emergency Medicine: Concepts and Clinical Practice (5th ed.). Mosby. ISBN 978-0323011853. ^ CAMJ (2008). "Fracture of the maxillary bone during hyperbaric oxygen therapy". Retrieved 17 December 2008. ^ Takenaka S, Arimura T, Higashi M, Nagayama T, Ito E (Aug 1980). "Experimental study of bleomycin therapy in combination with hyperbaric oxygenation". Nihon Gan Chiryo Gakkai Shi. 15 (5): 864–75. PMID 6159432. ^ Stubbs JM, Johnson EG, Thom SR (2005). "Trends Of Treating Patients, That Have Received Bleomycin Therapy In The Past, With Hyperbaric Oxygen Treatment (Hbot) And A Survey Of Considered Absolute Contraindications To Hbot". Undersea Hyperb Med Abstract. 32 (supplement). Retrieved 2008-05-23. ^ Feldmeier J, Carl U, Hartmann K, Sminia P (Spring 2003). "Hyperbaric oxygen: does it promote growth or recurrence of malignancy?". Undersea & Hyperbaric Medicine. 30 (1): 1–18. PMID 12841604. ^ Van Hoesen KB, Camporesi EM, Moon RE, Hage ML, Piantadosi CA (Feb 1989). "Should hyperbaric oxygen be used to treat the pregnant patient for acute carbon monoxide poisoning? A case report and literature review". JAMA. 261 (7): 1039–43. doi:10.1001/jama.1989.03420070089037. PMID 2644457. ^ Elkharrat D, Raphael JC, Korach JM, Jars-Guincestre MC, Chastang C, Harboun C, Gajdos P (1991). "Acute carbon monoxide intoxication and hyperbaric oxygen in pregnancy". Intensive Care Medicine. 17 (5): 289–92. doi:10.1007/BF01713940. PMID 1939875. ^ a b c d U.S. Navy Supervisor of Diving (Apr 2008). "20" (PDF). U.S. Navy Diving Manual. SS521-AG-PRO-010, revision 6. 5. U.S. Naval Sea Systems Command. Archived (PDF) from the original on March 31, 2014. Retrieved 2009-06-29. ^ Jørgensen TB, Sørensen AM, Jansen EC (April 2008). "Iatrogenic systemic air embolism treated with hyperbaric oxygen therapy". Acta Anaesthesiologica Scandinavica. 52 (4): 566–568. doi:10.1111/j.1399-6576.2008.01598.x. PMID 18339163. ^ Behnke, Albert R (1967). "The isobaric (oxygen window) principle of decompression". Trans. Third Marine Technology Society Conference, San Diego. The New Thrust Seaward. Washington DC: Marine Technology Society. Retrieved 20 July 2016. ^ Van Liew, Hugh D; Conkin, J; Burkard, ME (1993). "The oxygen window and decompression bubbles: estimates and significance". Aviation, Space, and Environmental Medicine. 64 (9): 859–65. ISSN 0095-6562. PMID 8216150. ^ Thom SR, Bhopale VM, Velazquez OC, Goldstein LJ, Thom LH, Buerk DG (April 2006). "Stem cell mobilization by hyperbaric oxygen". American Journal of Physiology. Heart and Circulatory Physiology. 290 (4): H1378–H1386. doi:10.1152/ajpheart.00888.2005. PMID 16299259. ^ a b c d e f g h i j k l m U.S. Navy Supervisor of Diving (April 2008). "Chapter 21: Recompression Chamber Operation" (PDF). U.S. Navy Diving Manual. Volume 5: Diving Medicine and Recompression Chamber Operations. SS521-AG-PRO-010, Revision 6. U.S. Naval Sea Systems Command. Archived (PDF) from the original on March 31, 2014. Retrieved 2009-06-29. ^ Malnati, Peggy (30 April 2015). "Uncompromising composite hyperbaric oxygen chamber closes the gap". compositesworld.com newsletter. Composites World. Retrieved 29 March 2016. ^ Staff (2014). "Hematocare : The revolution at 3 ata". Gaumond Medical Group Inc. Retrieved 29 March 2016. ^ a b Staff. "Hyperlite folding portable hyperbaric chambers" (PDF). Technical specifications. London: SOS Ltd. Retrieved 29 March 2016. ^ a b www.oxyhealth.com. "Portable Hyperbaric Chambers | Hyperbaric Oxygen Chamber | Hyperbaric Oxygen". Oxyhealth.com. Retrieved 2010-09-25. ^ Wood, S (2005). "Air break masks for monoplace chambers". Undersea and Hyperbaric Medical Society, Inc. Retrieved 8 April 2016. ^ Raleigh, G.W. (1988). "Air Breaks in the Sechrist Model 2500-B Monoplace Hyperbaric Chamber". Journal of Hyperbaric Medicine. Undersea and Hyperbaric Medical Society, Inc. Retrieved 8 April 2016. ^ "Undersea and Hyperbaric Medical Society". Uhms.org. Retrieved 2011-08-21. ^ "Product Classification, Chamber, Hyperbaric". United States Food and Drug Administration. Retrieved 2011-08-22. ^ a b Fitzpatrick DT, Franck BA, Mason KT, Shannon SG (1999). "Risk factors for symptomatic otic and sinus barotrauma in a multiplace hyperbaric chamber". Undersea & Hyperbaric Medicine. 26 (4): 243–7. PMID 10642071. ^ Fiesseler FW, Silverman ME, Riggs RL, Szucs PA (2006). "Indication for hyperbaric oxygen treatment as a predictor of tympanostomy tube placement". Undersea & Hyperbaric Medicine. 33 (4): 231–5. PMID 17004409. ^ Stein, L (2000). "Dental Distress. The 'Diving Dentist' Addresses the Problem of a Diving-Related Toothache" (PDF). Alert Diver (January/ February): 45–48. Retrieved 2008-05-23. ^ Smerz RW (2004). "Incidence of oxygen toxicity during the treatment of dysbarism". Undersea & Hyperbaric Medicine. 31 (2): 199–202. PMID 15485081. ^ Butler FK (1995). "Diving and hyperbaric ophthalmology". Survey of Ophthalmology. 39 (5): 347–366. doi:10.1016/S0039-6257(05)80091-8. PMID 7604359. ^ Butler FK, White E, Twa M (1999). "Hyperoxic myopia in a closed-circuit mixed-gas scuba diver". Undersea & Hyperbaric Medicine. 26 (1): 41–5. PMID 10353183. ^ Gesell LB, Adams BS, Kob DG (2000). "De Novo Cataract Development Following A Standard Course Of Hyperbaric Oxygen Therapy". Undersea Hyperb Med Abstract. 27 (supplement). Retrieved 2008-06-01. ^ Lehm Jan P, Bennett Michael H (2003). "Predictors of middle ear barotrauma associated with hyperbaric oxygen therapy". South Pacific Underwater Medicine Society Journal. 33: 127–133. Retrieved 2009-07-15. ^ Jain KK (1989). "Effect of Hyperbaric Oxygenation on Spasticity in Stroke Patients". J. Hyperbaric Med. 4 (2): 55–61. Retrieved 2008-08-06. ^ Singhal AB, Lo EH (Feb 2008). "Advances in emerging nondrug therapies for acute stroke 2007". Stroke: A Journal of Cerebral Circulation. 39 (2): 289–291. doi:10.1161/STROKEAHA.107.511485. PMC 3705573. PMID 18187678. ^ Eftedal OS, Lydersen S, Helde G, White L, Brubakk AO, Stovner LJ (Aug 2004). "A randomized, double blind study of the prophylactic effect of hyperbaric oxygen therapy on migraine". Cephalalgia: An International Journal of Headache. 24 (8): 639–644. doi:10.1111/j.1468-2982.2004.00724.x. PMID 15265052. ^ Fife WP, Fife CE (1989). "Treatment of Migraine with Hyperbaric Oxygen". J. Hyperbaric Med. 4 (1): 7–15. Retrieved 2008-08-06. ^ IN-DEEP. "Hyperbaric Oxygen Therapy for MS". Making Sense of MS Research. Retrieved 8 November 2012. ^ "Hyperbaric oxygen therapy Guidance to commissioners" (PDF). University of Birmingham. March 2012. Retrieved 8 June 2016. ^ Yoshida T, Kawashima A, Ujike T, Uemura M, Nishimura K, Miyoshi S (July 2008). "Hyperbaric oxygen therapy for radiation-induced hemorrhagic cystitis". International Journal of Urology. 15 (7): 639–641. doi:10.1111/j.1442-2042.2008.02053.x. PMID 18643783. ^ Noyer CM, Brandt LJ (February 1999). "Hyperbaric oxygen therapy for perineal Crohn's disease". The American Journal of Gastroenterology. 94 (2): 318–321. doi:10.1111/j.1572-0241.1999.00848.x. PMID 10022622. ^ a b Fischer BR, Palkovic S, Holling M, Wölfer J, Wassmann H (Jan 2010). "Rationale of hyperbaric oxygenation in cerebral vascular insult". Current Vascular Pharmacology. 8 (1): 35–43. doi:10.2174/157016110790226598. PMID 19485935. ^ Michalski D, Härtig W, Schneider D, Hobohm C (Feb 2011). "Use of normobaric and hyperbaric oxygen in acute focal cerebral ischemia - a preclinical and clinical review". Acta Neurologica Scandinavica. 123 (2): 85–97. doi:10.1111/j.1600-0404.2010.01363.x. PMID 20456243. ^ Spiegelberg L, Djasim UM, van Neck HW, Wolvius EB, van der Wal KG (Aug 2010). "Hyperbaric oxygen therapy in the management of radiation-induced injury in the head and neck region: a review of the literature". Journal of Oral and Maxillofacial Surgery. 68 (8): 1732–1739. doi:10.1016/j.joms.2010.02.040. PMID 20493616. ^ "Aerotherapeutics" . Encyclopædia Britannica. 1 (11th ed.). 1911. p. 271. ^ a b c d e f Sharkey, Sarah (April 2000). "Current indications for hyperbaric oxygen therapy". ADF Health. 1 (2). Retrieved 18 December 2013. ^ Brummelkamp WH, Hogendijk L, Boerema I (1961). "Treatment of anaerobic infections (clostridial myositis) by drenching the tissues with oxygen under high atmospheric pressure". Surgery. 49: 299–302. Kindwall, Eric P; Whelan, Harry T (2008). Hyperbaric Medicine Practice (3rd ed.). Flagstaff, AZ: Best Publishing Company. ISBN 978-1-930536-49-4. Mathieu, Daniel (2006). Handbook on Hyperbaric Medicine. Berlin: Springer. ISBN 978-1-4020-4376-5. Neubauer, Richard A; Walker, Morton (1998). Hyperbaric Oxygen Therapy. Garden City Park, NY: Avery Publishing Group. ISBN 978-0-89529-759-4. Harch, Paul G; McCullough, Virginia (2010). The Oxygen Revolution. Long Island City, NY: Hatherleigh Press. ISBN 978-1-57826-326-4.